Wednesday night at Knit Night, Ken saw me knitting as said something to the effect of, “Gee, you’re a lot further than the last time you posted!”. c) you’re running out of yarn, so you knit faster. Also, the photos tend to pile up! So, a snapshot of my knitting week. All done the body! I really am quite short of yarn, but have nixed the contrast colour idea. Instead, I dug up this skein of yarn which is the same colourway (Acorn) but is from a different lot. 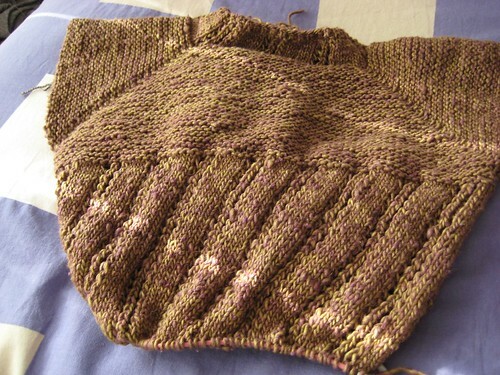 It is very, very, very different – it’s the pinky yarn in the bottom ribbing. I have about…60 grams of matching yarn left, plus a bunch of the pinky one. Sweater so far has taken about 290 g of yarn, plus the pinky one. Yeah, this one ain’t getting full length sleeves. So, the plan of attack – knit both sleeves, going back and forth, knitting up the rest of the yarn equally and decreasing right away. Once the matching yarn runs out, work the cuff in the pinky yarn to whatever length the sleeves turn out to be. I’m hoping for elbow-length, at least. wow. I’d never realized how much the “same” color could vary between dyelots. It’s a completely different color. 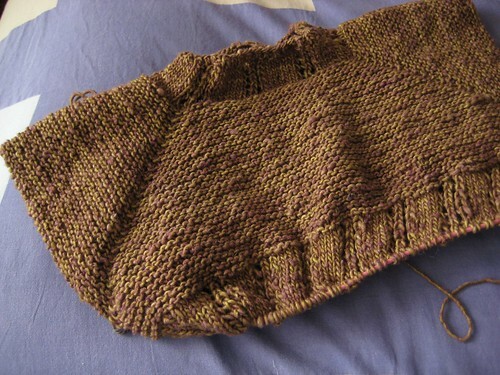 I’m knitting up your Thermal pattern (which is how I found your blog). It’s my very first adult-sized sweater, and I’m very excited about it. I got the yarn for Xmas and have been consumed with project monogamy since then (very unlike me). One more sleeve to go!! That’s awesome. I heart the pinkish hem. It looks like it should be some sort of combined flavoured chocolatey gingerbready cookie or something…maybe I’m just hungry. Wow that’s fast! I actually really like the contrasting hem, though I am surprised at how different the 2 dyelots are. It will be cute with the pink cuffs and a different twist on the tree jacket! Can’t wait to see it all done! it looks wonderful! I love my tree jacket! Gorgeous. Great pattern, great yarns. And I like the pinkish detail at the hem and cuffs, I think it will look really good. Can’t wait to see the finished product! I kind of like that pink trim, to be honest! Dye lots will never cease to fascinate me- damn, that’s a big difference! Your progress always SLAYS me! Is this one of your designs? 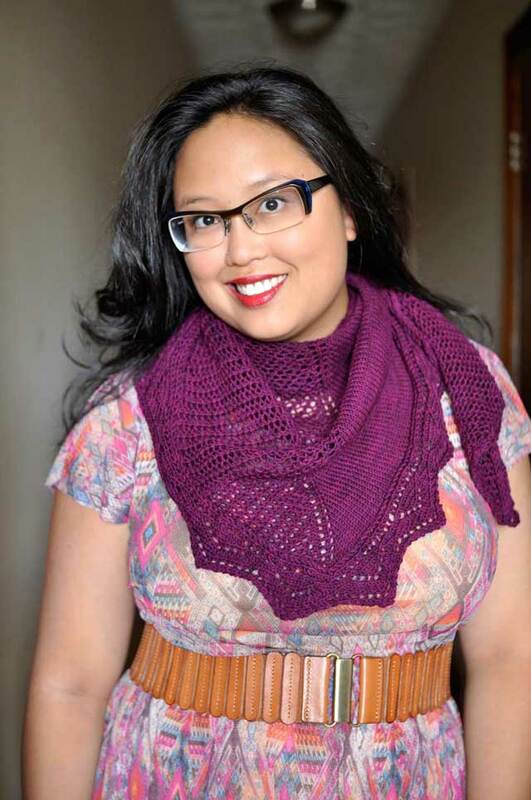 Hey, I thought I was the only one who knits faster when running out of yarn is imminent. (I’ve also been known to hide my head under the covers during an earthquake, though, so obviously my reactions to emergencies leaves something to be desired.) I’m loving that sweater. 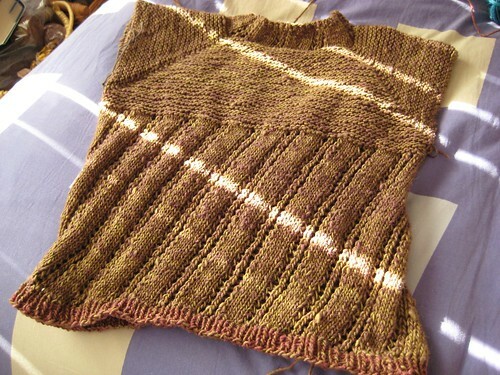 When I have that problem with dye lots, I usually just knit the sleeves/collar/cuffs with the mismatched color. As long as it’s symmetrical, it doesn’t bug me. Love the tree jacket progress. I’m amazed at your speed!